Now Fresh Grain-Free Small Breed Puppy Recipe is a high-priced dog food with exceptional quality. Here is what makes this food so good: It has 0 controversial ingredients and includes no artificial preservatives, colors and flavors. The food has well-balanced amounts of protein, fat and carbs with excellent meat and fat quality. Now Fresh also has no dog food recalls. Additionally, the company was very transparent when answering our questions. Watchdog Labs highly recommends this product. The average dog food we reviewed has 39 total ingredients, with 1 controversial ingredient. This product has 0 controversial ingredients - we love it. No controversial ingredients to be found on this dog food label, that’s what we like to see! Now Fresh Grain-Free Small Breed Puppy Recipe is made in Canada. Similar to the U.S., Canada enforces strict food safety laws for dog food brands. De-Boned Turkey and Canola Oil are the major meat and fat sources here, with protein and oils also coming from the other plant ingredients. Both De-Boned Turkey and Canola Oil clearly show us what animal and plant they are sources from, which is a very good. This dog food brand has a below-average number of recalls. 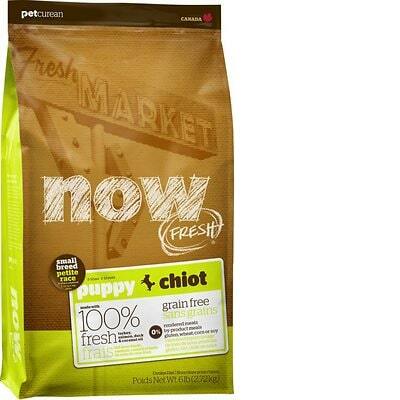 Now Fresh is part of the Petcurean Brand. They responded quickly, answering all the questions in two days. Its worthing noting that compared to other companies, these are some of the most complete and detailed answers that we received. Petcurean recipes have been developed by a team of qualified and passionate nutritionists. Our Senior Nutritionist Dr. Jennifer Adolphe, has a PhD in companion animal nutrition from the Western College of Veterinary Medicine at the University of Saskatchewan, a Master of Science degree in nutrition from the University of Saskatchewan, a Bachelor of Human Ecology degree in nutrition from the University of Manitoba, and is a registered dietitian with the College of Dietitians of British Columbia. She has completed a four year bachelor degree, a one year dietetic internship, a two year Master’s degree and a four year PhD. Thus, she has 11 years of training specializing in nutrition plus additional work experience. Petcurean has been in the business of pet nutrition for 19 years. Our products are formulated to meet AAFCO nutrient profiles for the stated life stage. Raw ingredients and finished products are laboratory tested for nutrient composition. We also perform digestibility, palatability, stool consistency, and urine pH testing in dogs and cats during our product development process. Our dry kibble is manufactured at our plant in Elmira, ON. Our canned GO! products are produced at plants in Canada and the US, and our NOW FRESH wet foods in tetra packs are made in Wisconsin. No, unfortunately due to insurance and safety concerns we do not allow visits by the public. Our plant is certified by the European Union who have the highest standards in the world for manufacturing and cleanliness. Public tours would compromise those standards with the potential for outside contamination and cross contamination..
We approach the quality and safety of our pet foods with utmost care and we set extremely high quality and safety standards for ourselves and all of our suppliers and partners. Petcurean products are manufactured at plants which are EU, FDA, BRC and CFIA certified, meaning they must meet a very high standard of sanitation, cleanliness and manufacturing practices. Our unique recipes are crafted using the highest quality ingredients. Other plant safeguards include: commissioning independent audits by the British Retail Consortium (also used for human food audits). We test our ingredients prior to receiving them at the plant; quality assurance tests include, but are not limited to, vomitoxin, aflatoxin, zearalenone, nutritional integrity and moisture levels. Testing continues on every batch at each part of the manufacturing process using standards set by Health Canada. These tests include but are not limited to, enterobacteriaceae such as salmonella and e-coli. We use Near Infra Red [NIR] technology during production to accurately measure the fat, protein and moisture content of the food. Food is only shipped, when favorable results are returned. We thoroughly clean and sanitize the manufacturing equipment between production runs to ensure the integrity of our recipes. We take important steps to avoid cross-contamination by requiring that employees in different areas of the production facility follow strict quality assurance protocols. We keep final tested food samples of all lots produced in our head office. All lot numbers can be tracked immediately using our complete and thorough tracking protocol. We update and monitor our quality control procedures regularly. As pet owners and animal lovers ourselves, we are committed to the health and safety of your pets and will continue to work diligently to ensure the quality and safety of all our products. In 2015, Petcurean opened a new manufacturing facility in partnership with Elmira Pet Products to ensure a secure supply for our growing customer base and provide us with a solid foundation to continually innovate the best, premium pet food recipes that our customers have come to know and expect. The new facility features state-of-the-art manufacturing equipment, which is owned by Petcurean and which is run by Elmira’s dedicated and knowledgeable operations staff. When it comes to our ingredient sourcing, you can rest assured that the animal source proteins, grains, cereals, fruits and vegetables in our GO! SOLUTIONS, NOW FRESH, GATHER and SUMMIT Original recipes are sourced from North America (as close to the production facility as possible). Our primary suppliers are based in Canada, however, due to some limits on availability, we have some USA based ingredient suppliers. Also, our venison and pasture raised lamb is sourced from New Zealand and Australia. Vitamin B6 is an essential nutrient for pets, so we chose to continue to include it to remain uncompromising in the nutritional adequacy of our foods. We source vitamin B6 and L-carnitine through a world leader in vitamin production, headquartered in the Netherlands with over 85 years of experience in both human and pet foods. We use Vitamin B6 and L-carnitine produced in one of their manufacturing facilities located in China since due to recent changes in the global supply chain Vitamin B6 is not available anywhere else. Our trusted supplier utilizes strict quality control procedures and is compliant with the FDA Food Safety Modernization Act (FSMA) Animal Food Rule of 2011, in addition to being registered to an International Quality Management Standard. Their vitamins are tested for microbiological contaminants and heavy metals and are analyzed for potency prior to being released for sale. We do not source any other ingredients, vitamins or supplements from China.